Potsdam to Berlin is like what Versailles is to Paris and it provides you with a bit of easy respite from the hustle and bustle of the German capital. No visit to Berlin is complete without visiting Potsdam. Directly located southwest of Berlin and with easy access via the S-Bahn train that runs every ten minutes from Alexanderplatz, Friedrichstraße, Hauptbahnhof and Zoologischer Garten, this capital of the federal state of Brandenburg is actually older, but much smaller, than Germany’s capital. It’s home to approximately 172,000 inhabitants and is world-renowned for its highly respected university. Yet, the city’s ultimate fame lies in its historical significance for being the summer residence of the Prussian kings, princes, and German emperors of the House of Hohenzollern who cleverly tapped some of the most talented architects and landscape gardeners – whom this part of Germany has ever seen – to create a fairy-tale landscape of palaces, gardens, and churches that ranks among the most beautiful in the whole world. Despite three Allied air raids on the city during WWII, much of the historic city center – including the charming Dutch Quarter – and most of the palaces and gardens on the northern and western parts of the city remarkably went untouched. In other words, Potsdam survived much of the Second World War; and to say that something survived the Second World War in this part of the country is truly saying something very special. It was therefore chosen as an appropriate venue for the Potsdam Conference of 1945 where U.S. President Harry S. Truman, Soviet Dictator Joseph Stalin, and British Prime Minister Winston Churchill – along with Clement Attlee – sat down in the Cecilienhof Palace – the residence of Crown Prince Wilhelm, the son of Kaiser Wilhelm II – over a 17 day period to talk about the fate of the post-WWII world, which would ultimately usher in the Cold War. This would also be the site where on July 26, 1945, the so-called Potsdam Declaration would be issued which called upon the Government of Japan to accept the Allies’s terms of unconditional surrender or be faced with prompt and utter destruction. Your guide can meet you either in Berlin, or directly in Potsdam to show you Potsdam’s glorious past while exploring the historic old town and many of the palaces and gardens around the city. Cecilienhof Palace – The last palace built by the Hohenzollern’s, this English-style palace became the site of the Potsdam Conference, which was held for 17 days after World War II ended in Europe. Marble Palace – Built in the late 1700s under the reign of Friedrich William II, this modest but beautiful palace was used as a military museum under the East German regime and has been recently restored. Alexandrovka – A Russian colony north of the city center built in the 1820s on the order of Friedrich William III. It originally housed a group of Russian choir members who Tsar Alexander I of Russia ordered to stay in Prussia after the Napoleonic Wars; some of whose descendants still live in the same houses. Dutch Quarter – A beautifully-restored part of the city center, the Dutch Quarter was designed by a Dutch architect to attract people from the Netherlands to settle in Potsdam at the beginning of the 1700s. After very few people came, it would end up housing local craftsmen, artists, families and soldiers of the Prussian army. 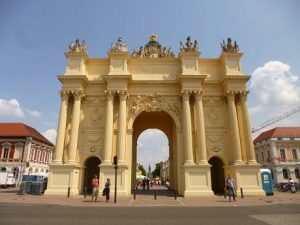 Brandenburg Gate – Potsdam’s own version of Berlin’s famous symbol was built as a triumphal arch after Frederick the Great’s victory in the Seven Years’ War (1756-1763). It is actually older than the Brandenburg Gate in Berlin (1791). Church of Peace – Located at the eastern edge of the Sanssouci Gardens, this church was built under the reign of Frederick Wilhelm IV in a Neo-classical style to emulate rural churches around Venice. It houses an impressive 11th-13th century Venetian mosaic. Sanssouci Gardens – Designed in the French Baroque style, the park is home to greenhouses, fountains, temples, and obelisks, as well as a Chinese Tea House. It is situated along a 2.5km (1.5 mile) pedestrian avenue, with the New Palace at the far end. Sanssouci Palace – The highlight of Potsdam and Frederick the Great’s Rococo masterpiece, the Sanssouci Palace is a stunning one-story palace situated atop a series of six terraces. Frederick the Great is buried beside the palace, along with his beloved greyhound dogs.